In 2005 Cerise Lim Jacobs set out to mark her husband’s birthday with a commissioned song-cycle. She finished with libretti to a trilogy of operas. The first to be performed was Madame White Snake, premièred in 2010 by Opera Boston, reviewed here), and winner of the 2011 Pulitzer Prize in Music. Charles Jacobs lived long enough to see the première but not the Pulitzer. Boston will now see the première of the Ouroboros cycle September 10th – 17th in the Cutler Majestic Theater, thanks to Beth Morrison Projects and Arts Emerson. In advance of this event, principals in the production spoke and performed at The Boston Athenæum on August 18th and composer Scott Wheeler (by email to BMInt earlier) kindly answered our questions. Madame White Snake begins with a Chinese folktale dating from the Tang and Five Dynasties period (7th – 10th centuries CE) and the earliest written version extant dates to the Ming Dynasty (14th – 17th centuries CE). It is now considered one of that nation’s four great folktales, and has grown and shifted over time. There are Taoist and Buddhist elements in this story of good and evil, a quest for immortality, an intergenerational quest to reunite a family, and stories of striving in the face of adversity and opposition; sometimes it is a tale of horror and sometimes a romance. There are television series, films, plays, picture books, modern dance interpretations, Chinese operas, and Western opera. Swatch even based a 2012 watch design on this legend, celebrating the Year of the Snake. It is a widely known cornerstone of Eastern folktales. …this epic cycle explores themes of life, death, and rebirth. Naga (composed by Scott Wheeler) is the story of a young Monk who renounces everything to find nirvana, but is tempted to abandon the path when he encounters The White Snake. Madame White Snake (composed by Zhou Long) is the story of a demon who longs to become human to experience love. And Gilgamesh (composed by Paola Prestini) is the story of Ming, the son of Madame White Snake, who realizes his true power and must choose between his family and happiness. Although this plot summary is straightforward, I expect the actual libretti will be denser, richer, and frequently defy rational ordering of plot. The ancient Greek image of a snake devouring its own tail finds description in Plato’s Timaeus but is better known through gnostic and alchemical texts. There is an ouroboros in Tutankhamen’s tomb (in a Book of the Dead); it appears in Indian mythology and in Norse tradition. A host of meanings are attributed to the image: formlessness; disorder; unity; rebirth; eternity; the soul of the world; perpetuity; magical protection—to name a few. White Snake and ouroboros are each fertile and potent; their combination could be all-encompassing, or overwhelming as reason and mysticism draw parallel to one another here. In keeping with the theme of change, flux, beginning without end and end without beginning, this operatic trilogy has three operas, three composers, three sets of musicians. Zhou Long composed Madame White Snake; Scott Wheeler composed Naga; Paola Prestini composed Gilgamesh. As the titles make clear, this is a combination of traditions (ancient near east; India; China) to go along with the combination of folktale and alchemist imagery. The main unifying factor is Cerise Lim Jacobs’ libretti. Although a trilogy from earliest days, she kept silent on this point to get Madame White Snake produced, citing the different operatic world ten years ago when premières were thin on the ground and getting one up was barely possible, let alone three. Further uniting these elements is Cori Ellison, dramaturg (currently serving in that capacity at Glyndebourne Festival Opera) and Michael Counts, director and production designer. Lim Jacobs and Ellison spoke at the Boston Athenæum in a preview event about the trilogy entitled “Life, Death & Rebirth.” Lim Jacobs introduced the event as “an almost-draft: no staging, no orchestra, no choruses.” We heard individual songs from all three operas, to whet the appetite and demonstrate the continuity within change. Ellison unpacked the meanings, the imagery, of ouroboros and invoked the work of Carl Jung on archetypes to explain their approach. Lim Jacobs described the clockwise movement of the snake devouring its tail, moving towards light and life. Each of the operas reincarnates into each other, with the libretti providing the structural unity. (I cannot help but think of the reincarnations of Doctor Who, last of the Time Lords, who has yet to be the subject of an opera.) There is also the numerological significance of 3: as presented, each of the three cycles commences with a different one of the three operas. This is a stream; we step into it where we will and that influences how we perceive, we receive, the whole. (Shades of Heraclitus here—another figure who has yet to be the subject of an opera.) There are also three composers for three operas. This, then, is not a trilogy as Western music usually has it; perhaps this could also be considered a protracted theme and variations? Although I do not think the operas call into question their own status as a trilogy, the performance of them as a cycle might. If there is an auteur here, it is Lim Jacobs who oversees the collaborative efforts of all. I can only speak for Naga, for which the latest libretto is version 28! Sometimes the impetus for a revision came from planning conversations between Cerise and me, sometimes from discussions with other members of the team, and sometimes in the process of writing the music I found that I wanted some sort of alteration in the text. Last fall we workshopped the entire first draft at New England Conservatory, working with stage director Josh Major, who also had excellent ideas. That workshop suggested several more improvements to both the libretto and the music. Throughout all of this, Cerise has been the opposite of a “diva” artist — she is endlessly willing to consider and reconsider any aspect of her text. Yet her initial idea was already very strong. I’m sure the very first draft of Naga was essentially the same work we have now– the operatic bones were always clear. Zhou Long, Paola Prestini and I are of course very different composers! For starters, we were born in Beijing, Italy and Washington DC respectively, moving on to equally divergent musical training. But Cerise’s three libretti have a great deal of consistency, not only in their overall mythic/operatic style but through the recurrence of certain characters, the re-incarnation of other characters, and the use of specific lyrics that return with completely different music as we move from one opera to the next. 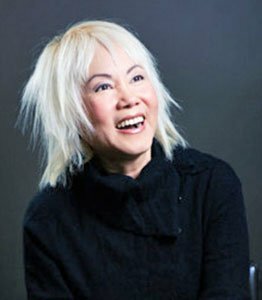 Cerise has created such a stylistically consistent and unique world that I suspect the divergent musical styles of the three composers will give the audience a more lively and varied experience of the trilogy as a whole than if any one of us had composed the music for all three. Zhou Long’s Madame White Snake was written and premiered in 2010, before either Paola or I got involved with the trilogy. I know I benefited from knowing Zhou Long’s score. He and I are friends, so I followed Madame White Snake from the press release announcement of the commission to the premiere with Gil Rose and Opera Boston, also at the Cutler Majestic, to its Pulitzer. Over the last couple years, as Paola and I composed our additions to the trilogy, we shared even our early sketches with the entire team, including each other, Cerise, Beth Morrison, director/designer Michael Counts, and dramaturg Cori Ellison. I also showed drafts of the score to conductor Carolyn Kuan, to conductor David Angus of Boston Lyric Opera (which co-commissioned Naga) and to several of the singers, of whom countertenor Anthony Roth Costanzo was especially helpful. I’ve never experienced such a collaborative process, and I couldn’t imagine a more friendly and collegial one. Did Paola and I influence each other creatively? Who knows? But we have certainly become friends and admiring colleagues. The long gestation period (longer than for traditional snakes, which seems fitting) certainly led to more people being involved. It is also remarkable that they remain friends at the end of this process which could have been arduous under other circumstances. The design and direction is by Michael Counts, with a single production team for the entire trilogy. Just as the libretti are connected, there are plenty of visual connections among the three operas—certainly in the sets and costumes, but also in the use of video. I’m sure our audience at the Majestic will always have a clear sense which of the three composers they’re hearing, but I think they’ll have an equally clear sense that they are in this particular trilogy, in the very detailed theatrical world of Cerise Lim Jacobs, Michael Counts and their production team. Until then, we have snippets of the music to entice us. At the Athenæum, we heard four songs from the three operas. In each opera there is a Ling Long Song, same words and always sung by a mother to her child, part a lullaby, and part a magical charm. The lyrics reference an anklet, and this sage yet foreshadowing advice: “As long as you wear this magic singing bell / Your mother will always find you wherever you dwell.” In Wheeler’s Naga it is sung by the Young Wife; we heard mezzo-soprano Sandra Piques Eddy. Eddy has a rich voice and great range; based on this one piece I would say that musically the idiom is post-Glassian in style. Next, from Zhou’s Madame White Snake, the titular character as sung by soprano Helen Hassinger gave voice. Hassinger has a brighter voice than Eddy, with rich sostenuto and remarkable command. This “Ling Long Song” has a slower tempo, more reflexive; this is nostalgia for a lullaby. The musical idiom here seems closer to post-Pärt tintinnabulations. 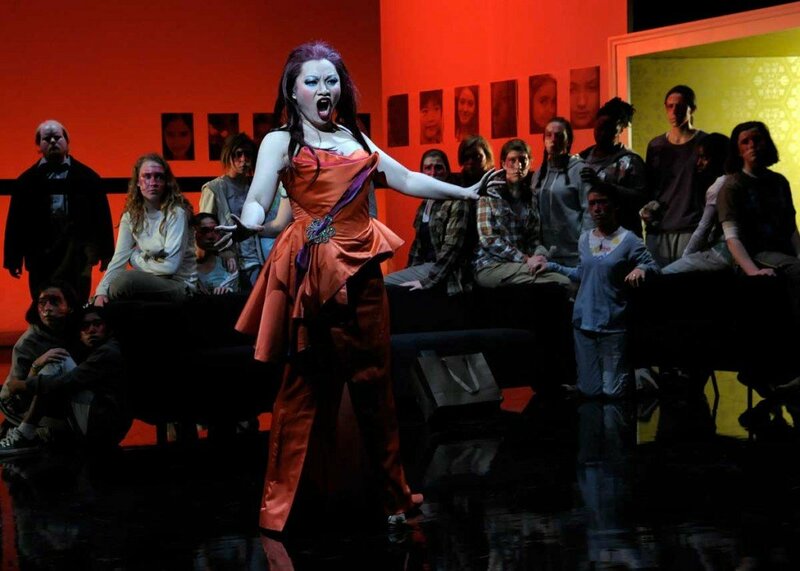 Rounding out this cycle of three, the lush-voiced soprano Celeste Godin as Ku in Prestini’s Gilgamesh. This is a more romantic setting, with polyphonic orchestration and a four-voiced fugue; musically this is post-Shostakovich (especially his Preludes & Fugues). In each of these songs, the colors of orchestration were absent since we benefitted from the talented accompaniment of Brett Hodgdon on piano but not a full orchestra. It will be interesting to hear these songs in full glory which might alter my perceptions (and again depending on the order of the operas). Finally, the preview performance gave us “Xiao Qing’s Lament” sung by countertenor Wee Kiat Chia from Wheeler’s Naga. This number voices the complaint of the Green Snake, companion and frenemy to Madame White Snake. Lim Jacobs described this is a tormented, bittersweet character and in the production it is both a reverse-trouser role and a hybrid role: the character is half-snake and the singer is costumed accordingly. Wee Kiat has a rich and deep countertenor voice, by turns convincingly loving and angry, tender and fierce, artfully capturing the impatience and love, jealousy and awe felt for Madame White Snake. Here I heard Wheeler using a more polyglot idiom. Cerise Lim Jacobs has assembled stellar performers and quite an ensemble. This première might well be the event of the season. Myriad threads reflect on the Ouroboros Trilogy and what we have seen and heard so far only serve as teasers. It remains to be seen how all of these warps and wefts weave together into an unending yet coherent and perpetual cycle of life, death, and rebirth. Visit ouroborostrilogy.org or facebook.com/ouroborostrilogy to learn more about this “one of a kind project.” Visit artsemerson.org for tickets and performance schedule.